Mom, the Intern: 9 weeks. Here is my 9-week belly shot, for all those who are interested. Not much of a belly at all, I'm afraid. Sorry to disappoint. Baby is about the size of a grape at the moment and all her essential organs are formed (even teeth buds!). Her eyes are fused shut though and will remain that way for the next 18 weeks or so. And you know how embryos kind of look like tadpoles at first? Well, her tadpole tail is gone now. Also, the placenta is starting to take over for the yolk sac which basically means any morning sickness I (should) have will be gone soon. In other news, I got another haircut the day after the belly shot was taken. I'm really digging this cut. 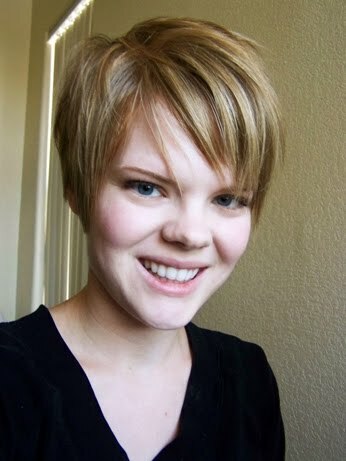 Seriously, short hair is AWESOME! Gosh you do the pixie so well. I love it! i love your belly, and you!!! keep up the good work mama. Your hair looks great! And it will be fun to see your belly grow along the way. That is no belly! But I remember how big you got with Bubby. And I LOVE the short hair. I can only imagine how nice it must be to not have to mess with it much with morning sickness and other pregnancy stuff. The hair and the belly look adorable!